I can’t remember what I did before I had a planner. I have no idea how I remembered appointments and things I needed to do. Possibly the appointments went in a phone calendar but the things to do? Post it notes and random scraps of paper I think. I have a memory like a sieve so I must have been doing something to keep on top of life. I’d like to say I got into planner as a way to sort my life out. I didn’t. I came across someone on Instagram who was decorating their planner and thought I liked the look of that. It looked like a nice creative outlet. Suddenly I started reading blogs that had these beautiful Filofaxes and found the world of kawaii stationery. I bought my first planner and washi and haven’t looked back since. Over time, the use of a planner has definitely developed from a creative outlet to something I can’t live without. I still decorate it and make it look pretty but over the years the functional use of a planner has become far more important. So much so that I’m making the jump away from a Happy Planner to a Hobonichi. Since I began planning I’ve started this blog and opened up the Etsy shop, alongside other hobbies and my full time job. I really couldn’t have stayed on top of it all without a planner. Well, several planners. You may think that’s giving some paper a little too much credit but seriously, I’ve got a memory like a sieve! There’s obviously lots of people who get by just fine without a planner, or have a smartphone that does everything for them. In case you’re currently thinking that set up isn’t right for you, or have been wondering why paper planners are suddenly making a comeback, I’ve put together my list of reasons why I need and use a planner. I’m going to attempt to do this in priority order and this is definitely my main reason. I like to see my month in one place with detail and ditto my week. When I open up my iPhone calendar it tells me the dates that something is happening, but if I want to know what, I have to go into that date. With my planner I just open up my monthly page(s) and can see everything in front of me. Birthdays, appointments and bills due. All there in one easy to see format. While I’m sure there are apps out there that try and give you that my phone screen is considerably smaller than even my smaller sized planner pages. It just doesn’t compare. Equally, being able to leave my planner open on my desk while I get on with my days means I can frequently just go back to it and tick off what I’ve done and see what’s still to do. That feels like so much less effort than getting my phone, unlocking it and opening up whatever app I’m using to track my day. If the to do list is in a different app to the calendar, they may even be more than one thing to check. Need a special tracker to track pain? You can find or make an insert or sticker for that. Want to plan out your blog post content, track social media shares and stats? You can find or make an insert or sticker for that too. When it comes to anything electronic, unless you’re a coder you’re pretty much bound to whatever someone else has made with limited customising available. Get yourself a notebook, pen and a ruler and you can make yourself a planner that perfectly fits your life and needs. If you have a printer and MS Office, you can design your own printed pages. Have a Silhouette and you can even make your own stickers. This probably sounds a little old womanish of me but I just don’t like the idea of my iPhone having everything. It’s already a phone, camera, iPod, games device and so much more. I don’t want to be so reliant on it that I need it to plan my life too. In a world where everyone is supposedly spending too much time in front of a screen, lets keep the things on paper that we can. Yes you can spend an absolute fortune on expensive planners and millions of stickers but all you really need is a notebook and a pen. A cheap diary from a supermarket will do if all you need is something to track birthdays and appointments. Work essentials. I love bullet journaling for work. Do you have a different system for work and home? If however you do want to fall down the stationery rabbit hole there is so much out there. I love creating sticker kits and planning out my week, trying to make it look pretty. If I really like a weekly layout, I definitely see a productivity benefit to it. I want to stay on track with whatever I’ve written in there if I like the layout and I look at my planner a lot more. I don’t always have the time to pursue all my creative hobbies, but a little bit of creative planning each week fills that hole. It also keeps me inspired to then make cards and sew when I do have the chance. I probably would have deleted my Facebook a long time ago if it weren’t for Facebook groups. Planning groups are filled with friendly people, great discussion and fantastic inspiration. Groups are literally the only thing I use the Facebook app for now. Had I not have got into planning I certainly wouldn’t have found these great online communities. 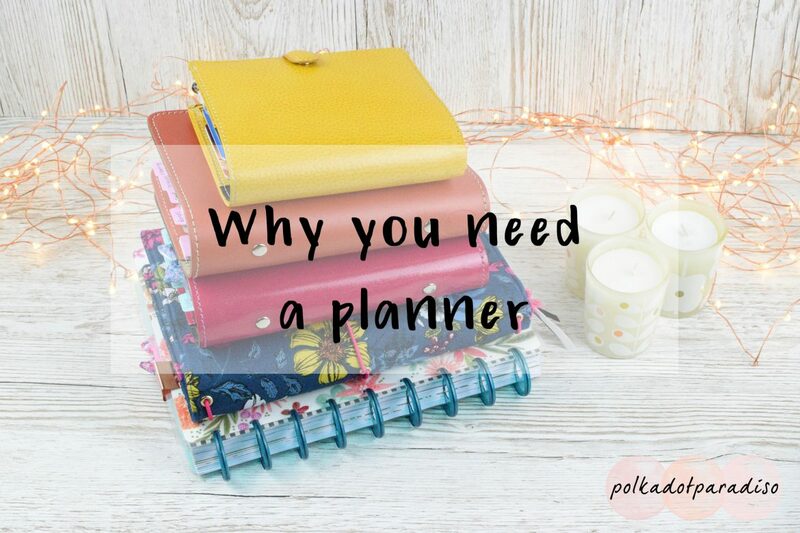 Why you need a planner? I’m sure some of you reading this probably disagreed with some of the reasons. Or all. That’s fine. Maybe you plan for a completely different reason? If you already plan and have different reasons for planning, please let me know in the comments below. I’d love to read some individual reasons and if there’s enough, do a follow up post with all the extra reasons everyone has.